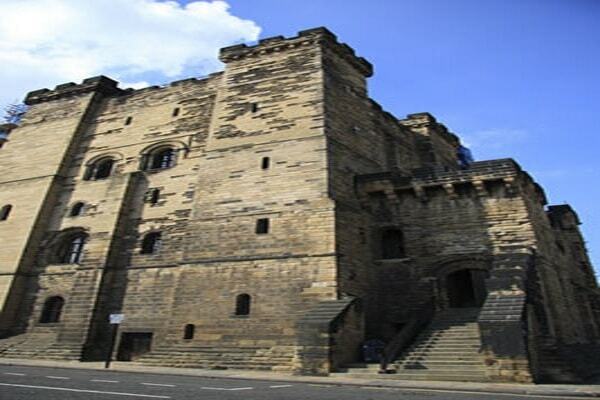 The Castle, Newcastle is a medieval fortification in Newcastle upon Tyne, England, built on the site of the fortress which gave the City of Newcastle its name. The most prominent remaining structures on the site are the Castle Keep, the castle's main fortified stone tower, and the Black Gate, its fortified gatehouse. There is a wooden fort here that was built on top of an Anglo-Saxon cemetery by Robert Curthose, the illegitimate son of William the Conqueror, although the present keep dates back from the twelfth century. There are rooms and staircases and a bare Norman Chapel that lie off the Great Hall. Inside the Great Hall are displays that relate to the Civil War siege of 1644 by a Scottish army that supported the Parliamentarian cause, there is also a small museum room that displays various archaeological finds. During the sixteenth and eighteenth centuries, down in the garrison room prisoners were incarcerated while locals rushed to its deep shelter during World War II to sit out German bombings. From the rooftop you can see for miles over the river and city.